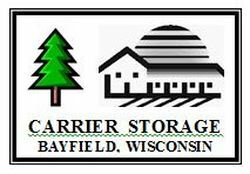 Carrier Storage offers self storage units and arena space rental in their modern facilities located on State Highway 13 one mile south of the City of Bayfield, Wisconsin. The storage units vary in size from 5 by 5 feet to 13 by 26 feet. Arena Storage is available for your boats, trailers and other large items. Call 715-779-5672 for rates and availability at our facilities.